We arrived at about 1:30pm on New Year eve, and it was crowded. There was a line up but not long. I was surprised to find still so many people out in the cold, especially when there were flurries coming down. At the Brunch Box, the only and fastest way to order is grab a sheet and a marker and tick-off what you want. The place is open for breakfast/brunch/lunch and dinner (on weekdays). 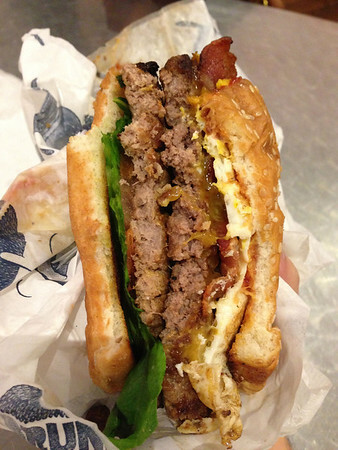 Since it was past noon and we were starving, we decided to for a burger. And good thing I had checked-in on Foursquare, which saved me 50% of whatever I ordered. 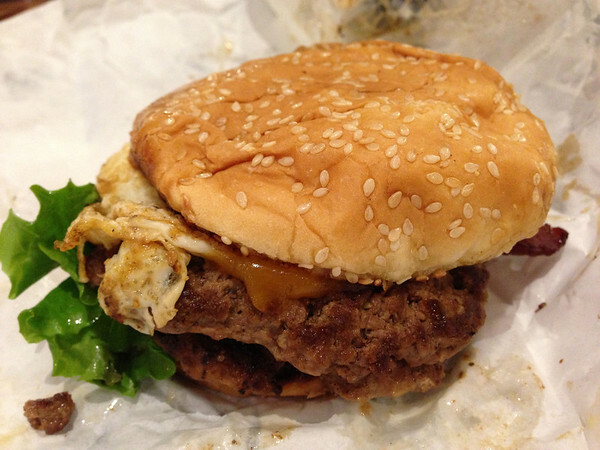 So $4 for a burger was way better than McDonalds. We got the Slaughterhouse IV with everything on it. It’s a beef patty, turkey patty, bacon, egg and cheddar cheese with lettuce, tomatoes, grilled onions, ketchup, mustard and mayo. 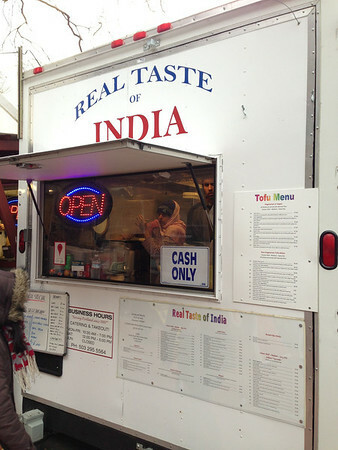 We also tried a food cart down the street called “Real Taste of India”. It sounded authentic and original. And the person waiting for her food highly recommended us for the $6 lunch special. 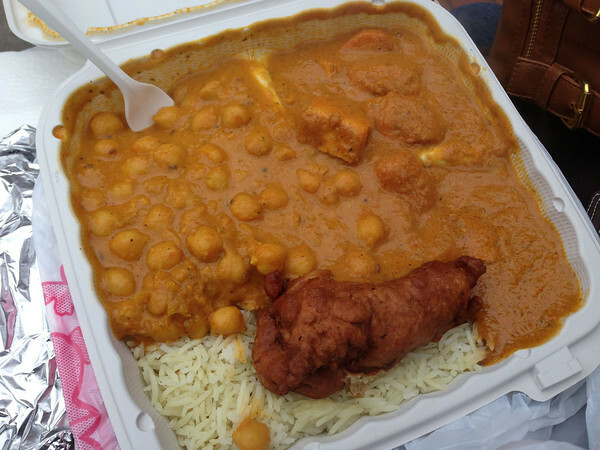 It came with chicken masala, rice, naan, some beans (sorry, I forgot the name) and a deep fried chicken roll. The sauce was delicious and all the chicken came with white meat. The feeling of having comfort food in such cold weather was just warm and satisfying. 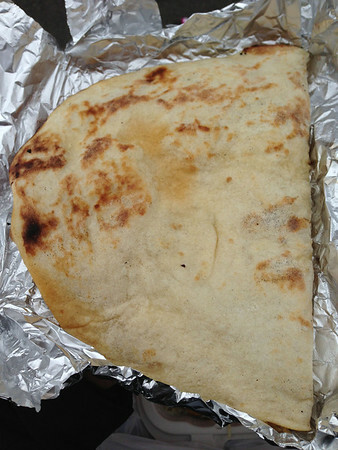 The naan was most impressive and acted as like a hand warmer. In fact, it was so hot that it was too hot for the hand. The naan was soft and crispy. 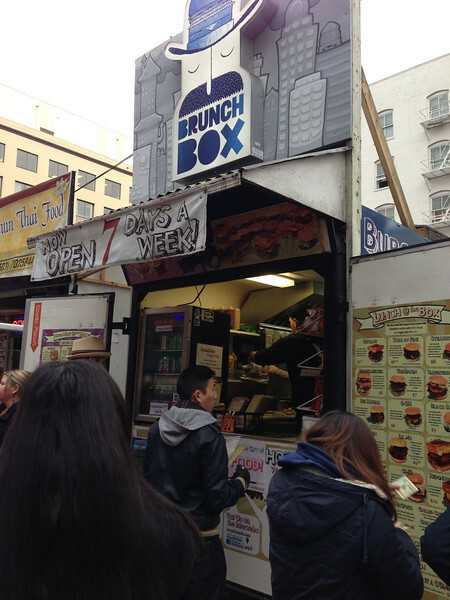 Ironic as it sounds, but it was very well done for a food cart.